Tokyo: For Toyota Motor Corp, China wasn’t always the first pit stop when it came to unveiling key car models. But this time, it’s different. The Japanese automaker is set to take the wraps off the all-new Corolla — and its China-only twin Levin — at a global premiere in Guangzhou on Friday, hours before it’s put on display in California. The move marks Toyota’s deeper push into the world’s biggest auto market where it is trailing rivals. The Corolla, the staid workhorse that seldom makes heads turn but is still loved universally, is getting a facelift at a time sedans are losing their sheen in the US while gaining followers in China. Built on Toyota’s new global architecture platform, the models to be unveiled will offer more connectivity and intelligent features to lure Chinese buyers. China overtook the US to become the largest market for the compact sedan last year, with the combined annual deliveries of Corolla and Levin reaching half a million and taking the lead in the segment. Amid a sharp demand shift to SUVs in the US, Toyota is increasingly counting on China to sustain the success story of the world’s best-selling model of any carmaker over the last thirty years. Reflecting the slumping demand for sedans in the US, Toyota plans to slow one of the three assembly lines at its Camry assembly plant in Kentucky next month. In China, the Corolla and Levin contribute about 40 per cent of Toyota’s sales and are key to changing the automaker’s also-run status. Toyota sold 1.29 million vehicles in China last year and is targeting 1.4 million this year, compared with sales of more than 4 million units each at Volkswagen AG and General Motors Co.
Japanese competitors Nissan Motor Co. and Honda Motor Co., though smaller globally, have also been quicker than Toyota in ramping up sales in China. “Toyota believes it has potential to raise its market share given it is low compared with the US,” said Janet Lewis, an analyst at Macquarie Capital Securities in Tokyo. Key to reversing that laggard status is the ever-reliable Corolla, a car so reputed for its quality that many owners prefer another Toyota for their next purchase. Toyota has traditionally been concentrating on the US, even after China overtook it to become the world’s largest car market in 2009. Now though, the famously cautious Japanese manufacturing giant has added incentive to shift focus as China moves to loosen restrictions while the US threatens to raise trade barriers. As of now Toyota has been largely unscathed, or even has actually benefited from the US-China trade war. While China in July increased the levy on vehicles imported from the US to 40 per cent, it almost simultaneously lowered the duty on other imported cars to 15 per cent. That has in particular benefited Toyota’s luxury Lexus vehicles exported from Japan to China. That, coupled with continued strong demand for the outgoing Corolla and the new Camry, helped Toyota boost China sales by 13 per cent in the first nine months this year, bucking an industry slowdown and leading the gains by major carmakers. This also has boosted confidence for Toyota to set its eye on tripling car production in China by as soon as 2030. To be sure, Toyota’s future growth hinges on how the company embraces new-energy vehicles. Under China’s so-called cap-and-trade policy, automakers must obtain a new-energy vehicle (NEV) score — which is linked to the production of various types of zero- and low-emission vehicles — starting January. Toyota, which has been a laggard in pure-electric cars, had to speed up in NEVs. Unlike VW or GM, the conventional hybrids with which Toyota is the indisputable leader will be central to the company’s electrification efforts. 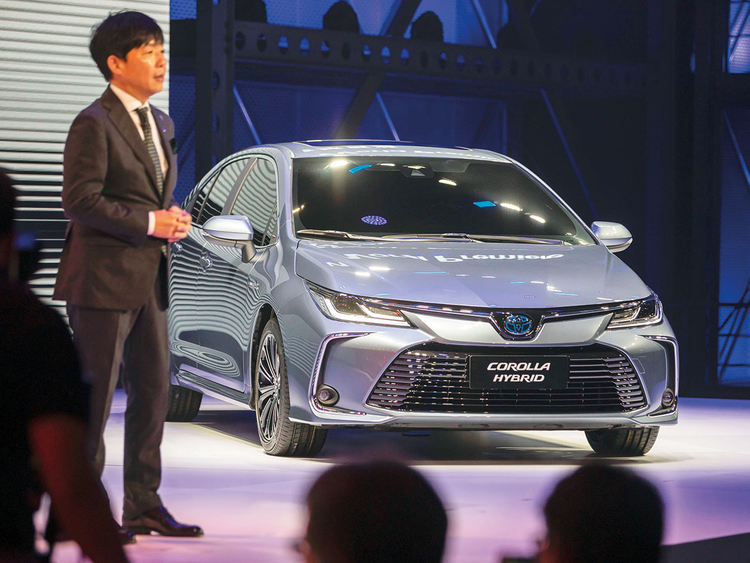 Toyota intentionally put two gasoline-electric versions of the Corolla and Levin on display in Guangzhou, as sales of hybrid models have started to take off since it localised production in 2015. However, conventional hybrids are unlikely to be included as NEVs in China and it remains to be seen how far they can go without much government support that EVs and plug-ins receive. To find allies promoting the technology, Toyota has engaged in advanced talks to license its hybrid system to Chinese carmaker Geely Automobile Holdings Ltd, Bloomberg has reported. “Hybrids are very important to Toyota’s China and global strategy, but it only works in China if other companies produce them,” Lewis said.